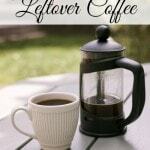 Katie recently shared some ideas on how to spruce up your Holiday table with a few simple tips. So I decided to take some of her tips and put them into this month's Christmas Table Decor idea. Recently I shared a few tips on how you can put together a last minute table setting in under 30 minutes. 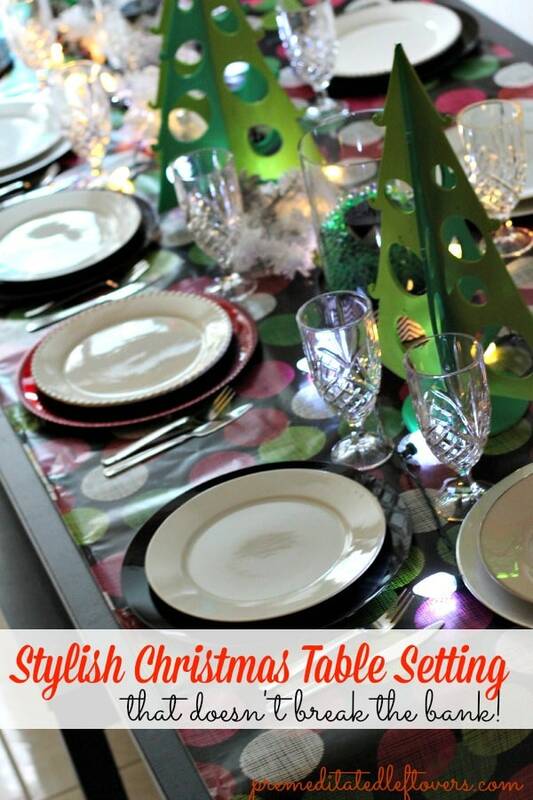 I took my own advice and looked around my Christmas closet to see what decor pieces I could put together for a Stylish Christmas Table Setting. Each Christmas I like to decorate my house in a theme. In years past, I have had a Black & White Theme, A Winter Wonderland Theme, and this year A How the Grinch Stole Christmas Inspiration theme. It's frugal and cost-effective. You can pick up a roll of really nice wrapping paper for about $3-$4 bucks. I usually hit up Hobby Lobby when they have their 50% off Christmas sale. Or I wait until after the Christmas season to buy wrapping paper for 90% off. It's beautiful! You can find any color, theme and texture. You can use wrapping paper for so many other projects. For an example, I also use wrapping paper to decorate vases. You can see an example HERE. It makes the clean up process quicker. You know how people accidentally spill the red pop on your white Christmas table cloth? 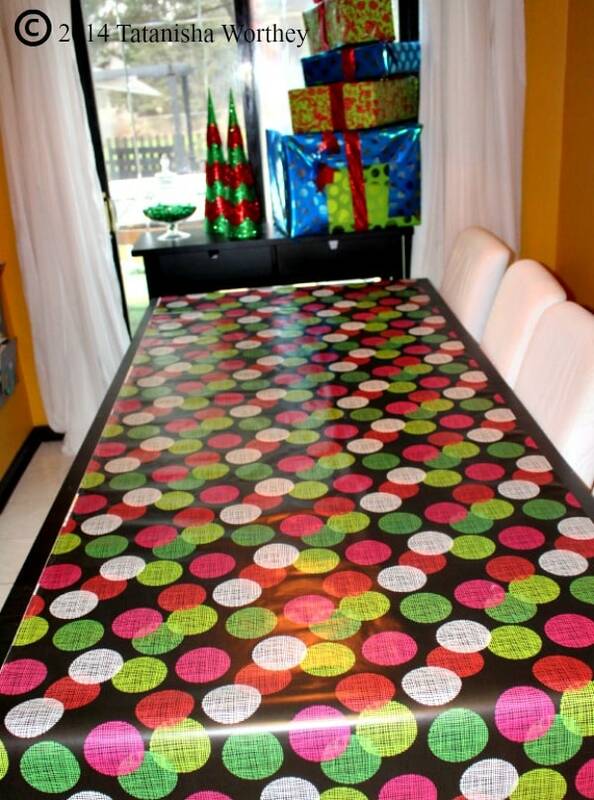 You can avoid that by using a festive Christmas wrapping paper as the table cloth and/or runner for your table. Trust me, you'll thank me later! For part of the centerpiece, I used two black and white candle holders from Ikea. 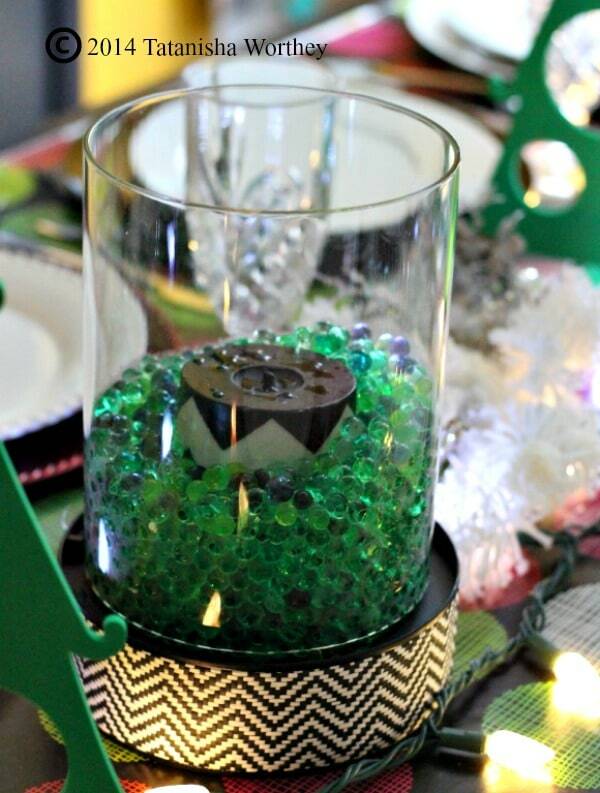 I filled the candle holders with clear water beads in one, and green water beads in the other holder. 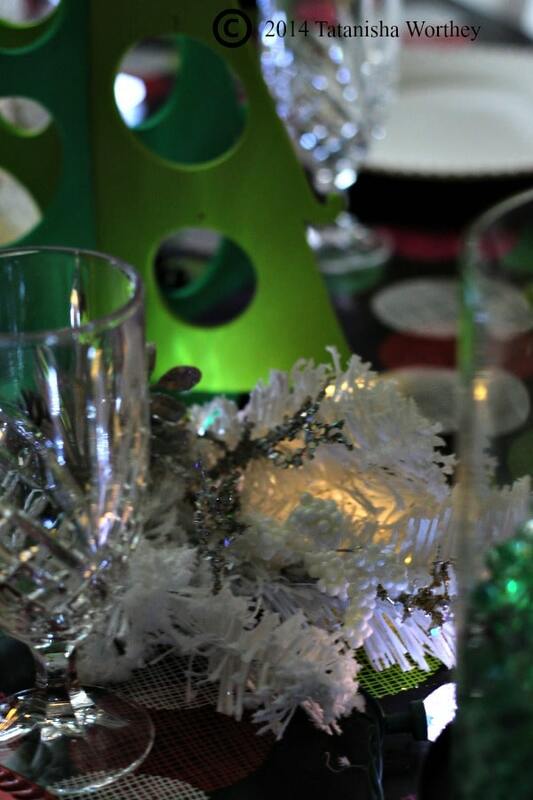 I used Katie's tips on using lights and fresh elements for the centerpiece as well. I laid two sets of white crystal LED lights the length of the table. I decided to use the length of the table for the whole centerpiece. 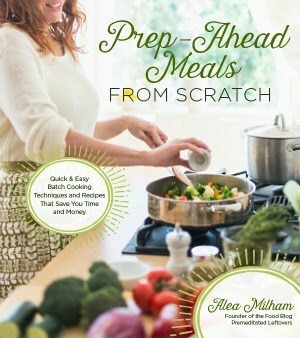 Sometimes this can be tricky to do, especially if you want to add food on the table. 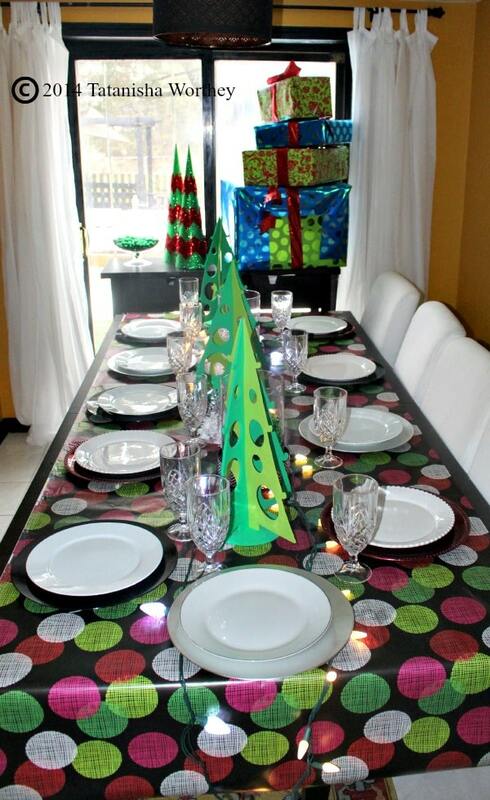 I placed green paper Christmas trees throughout the table(I picked these up at Target last year 90% off). I also added wintery white leaves throughout the table. I used silver, black and red plate chargers. 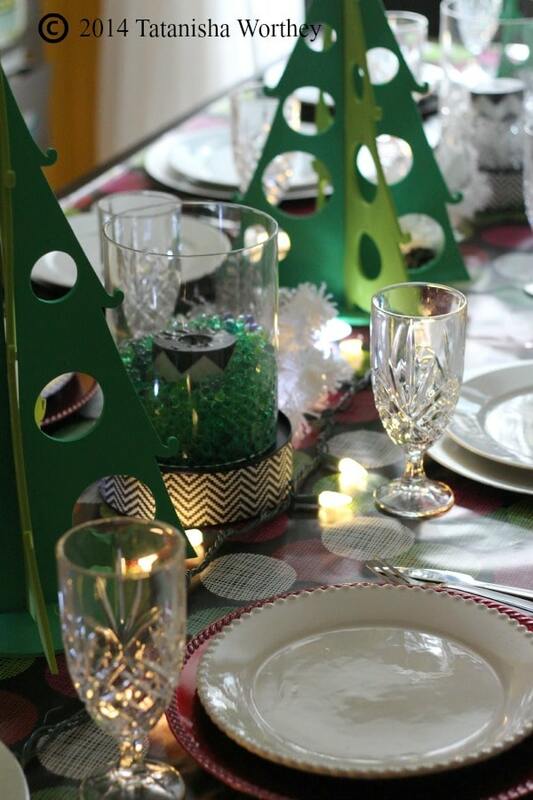 Topping them with simple white plates, silverware and adding crystal drinking glasses finished off this simple, but yet stylish Christmas Table Decor. The only thing missing from this set is having snow falling outside. My backyard is ugly to look at during this time of year. The snow is always good at covering up those blah brown spots. 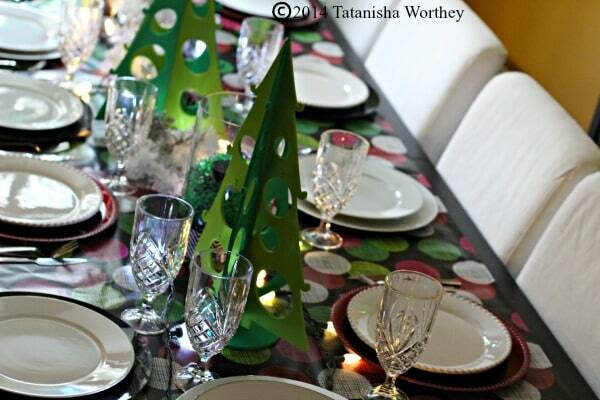 As you can see this Christmas Table Setting did not require a lot of pre-planning or design knowledge. You can pull of this simple, yet stylish look as well. Sometimes, less is better. Just a few simple pieces can give you a beautiful table without even trying. 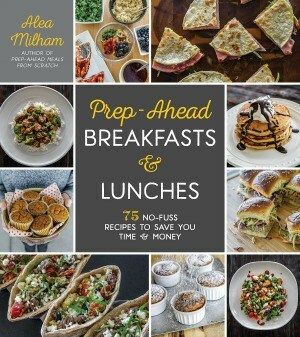 I used everything I had on hand, so I didn't have to rush out to spend unnecessary money. Using my “premeditated leftovers” from previous Christmas themes pulled this elegant, yet simple design together. 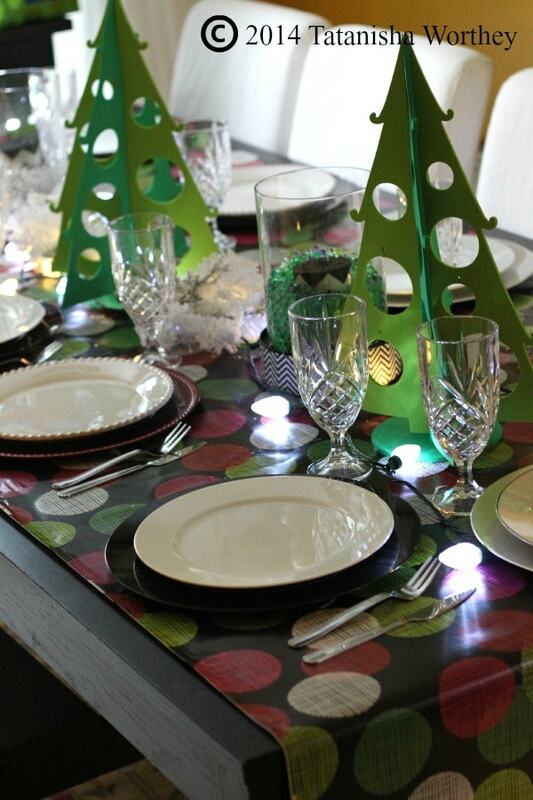 How do you plan on decorating your table this year for Christmas? 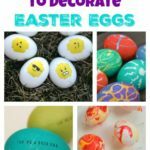 Do you decorate the whole house? Annual themes? Leave me a comment below! I would love to hear what you have to say! 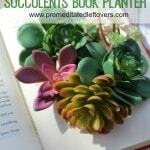 You can find her designing new and frugal ideas at Table Decor Ideas.